Copyright: © 2016 Negrychb N, et al. This is an open-access article distributed under the terms of the Creative Commons Attribution License, which permits unrestricted use, distribution, and reproduction in any medium, provided the original author and source are credited. Monitoring of multiple sclerosis (MS) requires of molecular markers. Recently, using TCA-precipitation/ extraction and MALDI TOF/TOF mass-spectrometry, we identified in blood serum of multiple sclerosis (MS) patients earlier unknown 46 kDa form of human unconventional myosin IC isoform b (Myo1C) (Myronovskij et al., 2015). During SDS-electrophoresis of TCA-extracted proteins of blood serum of 28 MS patients, 3 additional polypeptides with 55, 50 and 25 kDa molecular masses were detected. Western-blot analysis using monospecific anti-human IgG rabbit HRP-conjugated antibodies showed that 55 and 25 kDa polypeptides belong to heavy and light chains of IgG molecules, while 50 kDa protein corresponds to free heavy chains of IgGs. None of these polypeptides was found in fractions of TCA extracted polypeptides isolated from blood serum of healthy human donors or patients with systemic lupus erythematosis and rheumatoid arthritis. Multiple sclerosis (MS) is an inflammatory disease in which the myelin sheaths around axons of brain and spinal cord are impaired, thus, leading to demyelination and scarring . This results in a wide range of symptoms. Pathogenic mechanisms of the MS have an autoimmune character due to cellular and humoral immune reactions towards brain tissue self-antigens, mainly the myelin basic protein (MBP) [2,3]. However, the molecular targets and the mechanisms involved in myelin damage have not been clearly defined. Different self- antigens have been investigated as potential targets for T or B cells . The most extensively studied putative self-antigens are components of normal CNS myelin, such as the myelin basic protein (MBP), proteolipid lipoprotein, myelin oligodendrocyte glycoprotein (MOG), post-translationally modified forms of these myelin proteins [5,6], or components originating from the glial cells [7,8]. Thus, the autoantibodies can play a crucial role in the development and progression of the MS. Blood serum has been extensively explored as a source of the bio-markers, because it may contain not only proteins per se, but also proteins originating from various tissues of the body [9,10]. Up to 10,000 proteins (and/or their fragments) were detected in human blood serum, and most of them are present there in very low concentrations . Using various procedures of protein preparation, especially the enrichment, may be useful in a successful search for the molecular biomarkers [9,11]. At purification and concentration of proteins for the MALDI TOF/TOF, a 2,2,2-trichloroacetic acid (TCA)- induced protein precipitation is frequently used , although the TCA-extracted proteins remain out of the study. Recently, we have shown that a TCA-extracted fraction obtained from blood serum of MS patients contains two proteins that were identified by the MALDI TOF/TOF as blood serum albumin (BSA) and 46 kDa form of unconventional myosin 1c (Myo 1C) . Here we demonstrated that TCAextracted fractions isolated from blood serum of MS patients also contain IgGs and/or their heavy chains. These proteins were not detected in TCA-extracted fractions isolated from blood serum of healthy human donors and patients with systemic lupus erythematosus or rheumatoid arthritis. According to our protocol, 1 ml of blood serum was diluted 2-fold with phosphate buffered saline (PBS), and then 100% TCA was added to 10% of final concentration. After 30 min incubation at -20°C, the solution was subjected to centrifugation at 10,000 g for 15 min. The supernatant containing TCA-soluble compounds was isolated and mixed with acetone in 1:6 ratio, followed by incubation at -20°C for 18 h. The precipitate was pelleted by centrifugation for 10 min at 10,000 g. The pellet was dissolved in distilled water and protein concentration was measured at 280 nm using NanoDrop ND1000 spectrophotometer (NanoDrop Technologies, USA). The solution was stored at -200°C until use, but no longer than 1 month. SDS-electrophoresis of TCA-extracted blood serum proteins was performed in 12% PAG  and followed by protein staining on gel by Coomassie Brilliant Blue G dye. For Westernblot analysis, proteins were transferred from gel onto a nitrocellulose membrane, and the membranes were blocked (1 h at 20°C) with 5% non-fat milk in the PBS containing 0.05% Tween-20. The blots were washed three times for 5 min each with the PBS supplemented with 0.01% Tween-20, and then probed with specific antibodies. To identify 55 and 25 kDa polypeptides in a pool of TCA-extracted proteins of blood serum, polyclonal anti-human IgG (whole molecule) rabbit HRP-conjugated antibody (Sigma-Aldrich, product number A8792) in 1:40,000 dilution was used (2 h, 24°ÃÂ¡). Immunoconjugates were detected by the enhanced chemiluminescence (ECL). Blood serum was extensively studied as a source of the biomarkers. In order to search for proteins potentially associated with the MS, we have studied proteins isolated from blood serum by an extraction with 10% TCA. The results of the SDS electrophoresis have shown that a TCA-extracted fraction obtained from a blood serum of MS patients mainly contains proteins with 66, 55, 46, and 25 kDa molecular masses (Figureure 1A). 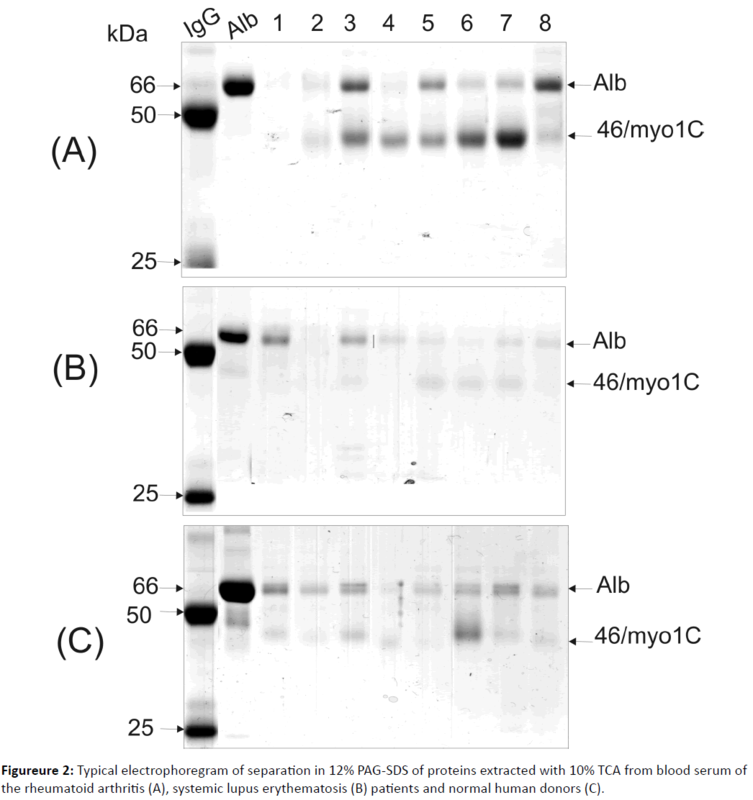 Figure 1: Typical electrophoregram of separation in 12% PAG-SDS of proteins extracted with 10% TCA from blood serum of the multiple sclerosis patients (A), and the results of Western-blot analysis using anti-human (whole molecule) rabbit antibodies (IgGs conjugated with horse radish peroxidase (B). M, molecular mass of protein standards. Lanes 1-7, the samples of TCA-extracted proteins. Arrows point the polypeptides identified by the MALDI-TOF mass spectrometry as blood serum albumin (BSA) and as 48 kDa form of the unconventional myosin 1C (Myo1C). MALDI TOF/TOF analysis identified 66 kDa and 46 kDa polypeptides as blood serum albumin and 46 kDa fragment of the un-conventional myosine 1c (Myo 1C) , while the nature of two other proteins remained unknown. We have suggested that these 55 and 25 kDa polypeptides (Figureure 1) correspond to heavy and light chains of the IgGs. In order to prove this suggestion, Western-blot analysis was used with the polypeptides probing by the mono-specific anti-human IgG antibodies (Figureure 1B). As a positive control, the IgGs that were affinity purified from blood serum of a healthy human donor was used (Figure 1B, lane designed as “IgG”). As a negative control, the TCA-extracted fraction of sample where these polypeptides were not detected was used (Figure 1B, lane 4). It was found that 55 and 25 kDa polypeptides are capable of binding with anti-human IgGs antibodies, thus, they might correspond to heavy and light chains of human IgGs. Screening of the TCA-extracted fraction obtained from blood serum of 28 MS patients was conducted. It was revealed that this fraction of blood serum of two MS patients contained IgG polypeptides and two MS patients contained free heavy chains of IgGs. Electrophoretic analysis of the TCA-extracted fraction isolated from blood serum of 22 patients with a rheumatoid arthritis, 24 patients with a systemic lupus erythematosus and 12 healthy human donors did not reveal polypeptides corresponding to heavy and/or light chains of the IgG molecule (Figureure 2). Western-blot analysis of these samples using mono specific anti-human IgGs antibodies proved these data (results are not shown). Figure 2: Typical electrophoregram of separation in 12% PAG-SDS of proteins extracted with 10% TCA from blood serum of the rheumatoid arthritis (A), systemic lupus erythematosis (B) patients and normal human donors (C). Thus, we have found data that blood serum of some MS patients (4 out of 28 screened) contains the IgGs or their heavy chains with a unique capability of dissolving in 10% TCA. It is known that proteins dissolved in strong acidic conditions, as a rule, possess high positive charge, for example, histones. A question appears - Why the IgGs and their heavy chains in some MS patients show such property, while other immunoglobulins are precipitated with 10% TCA ? It should be stressed that heavy chains of IgGs extracted by the TCA from blood serum of these MS patients demonstrated an elevated molecular mass (55 kDa) comparing with heavy chains of IgGs that were similarly purified from blood serum of healthy human donors (50 kDa) (Figure 1B). We assume that the unusual property of the IgGs dissolving of some MS patients in 10% TCA could be linked with hyper-glycosylation of heavy chains of these IgGs and the resulting increase in their molecular mass from 50 to 55 kDa. The elevation of the molecular mass of heavy chains of IgGs caused by glycosylation was earlier described in patients with the rheumatoid arthritis [15,16]. Interestingly, the anticitrullinated protein antibodies detected in the MS patients acquired a pro-inflammatory Fc glycosylation phenotype prior to the onset of the rheumatoid arthritis . To address potential clinical reasons for appearance of unique IgGs and their heavy chains in blood serum of some MS patients, we investigated their history presented below. Patient 1: Male, 33 years old, a welder. Patient’s history: concussion and clavicle fracture, in childhood, suffered from the atopic dermatitis. Family history: father has MS. The onset of the MS developed at the age of 17 when the patient noticed weakness in left extremities and blindness in the right eye. Definite MS diagnosis was confirmed at the age of 21. At the moment of examination, the patient had a remission of MS. The disease form is a relapsing–remitting MS. The duration of the disease is 12 years. The number of relapses is 12. EDSS (Expanded Disability Status Scale) score-4.0. The patient has never received any disease modifying treatment. Patient 2: Female, 47 years old, a seamstress. Personal history: peptic ulcer disease. Family history: not significant. The onset of the MS developed at the age of 27 when the patient noticed double vision. Definite MS diagnosis was confirmed in the year of the onset after the next relapse. At the moment of examination and blood sampling, the patient has a relapse of MS. The disease form is secondary progressive MS. The duration of the disease-20 years. The number of relapses-20. EDSS score-6.5. A year before the patient has finished a 3-year course of disease modifying treatment. Patient 3: Female, 26 years old, a hairdresser. Personal history: missed miscarriage, scoliosis. Family history: not significant. The onset of the MS developed at the age of 24 as dysarthria, tinnitus, numbness of the mouth and face. Definite MS diagnosis was confirmed during the same year. At the moment of examination and blood sampling, the patient has a relapse of MS. The disease form is a relapsing– remitting MS. The duration of the disease-1.5 years. The number of relapses-3. EDSS score-3.5. The patient has never received disease modifying treatment. Patient 4: Male, 51 years old, a fireman. Personal history: not significant. Family history: not significant. The onset of multiple sclerosis developed at the age of 41 when the patient felt severe weakness in the lower limbs. At the moment of examination, the patient has a relapse of MS. Definite MS diagnosis was confirmed after clinical examination and MRI investigation during the visit. The disease form is a relapsing–remitting MS. The number of relapses-2. EDSS score-2.5. The patient was recommended to start disease modifying treatment. Thus, three of four patients had a relapse of MS at the moment of examination and blood sampling. They suffered from different clinical course of MS: three had relapsing - remitting MS, and one had secondary progressive MS. Disability rate (EDSS score) varied from minimal (EDSS score-2.0) to severe (EDSS score-6.5) disability. The most notable was the difference in disease duration, including patient in the very start of the disease (patient 4) and patient having MS for 20 years (patient 2). At the moment of examination, two patients had comorbidities (peptic ulcer disease, scoliosis). No patients suffered from diabetes mellitus or autoimmune diseases apart from MS. The personal history, disease anamnesis and clinical peculiarities of multiple sclerosis in four patients mentioned above were thoroughly analyzed. We have not found any signs that could explain probable hyperglycosylation of the IgGs. Additionally, the other 24 patients with MS, who participated in our research, did not show such unusual IgGs in their blood serum. Blood serum of some MS patients contains TCA-soluble IgGs or free heavy chains of IgGs, which were not described earlier in these patients. Their origin and function remain unknown yet, but their further investigation could shed light on multiple sclerosis development and pathogenesis. We are very grateful to Professor Valentina Chopyk, Dr.Yaroslav Tolstayk and Dr. Iryna Kril’ for providing us the blood serums of SLE and RA patients. Weinshenker BC (1996) Epidemiology of multiple sclerosis. NeurolClin 14: 291-308. Harris VK, Sadiq SA (2009) Disease biomarkers in multiple sclerosis: potential for use in therapeutic decision making. MolDiagnTher 13: 225-244. Tomioka R, Matsui M (2014) Biomarkers for multiple sclerosis. Int Med 53: 361-365. Lefranc D, Almeras L, Dubucquoi S, de Seze J, Vermersch P, et al. (2004) Distortion of the self-reactive IgG antibody repertoire in multiple sclerosis as a new diagnostic tool. J Immunol 172: 669-678.
de Seze J, Dubucquoi S, Lefranc D, Virecoulon F, Nuez I, et al. (2001) IgG reactivity against citrullinated myelin basic protein in multiple sclerosis. J. Neuroimmunol 117:149-155. Abramsky O, Lisak RP, Silberberg DH, Pleasure DE (1977) Antibodies to oligodendroglia in patients with multiple sclerosis. N Engl J Med 297:1207-1211. Selmaj K, Brosnan CF, Raine CS (1992) Expression of heat shock protein-65 by oligodendrocytes in vivo and in vitro: implications for multiple sclerosis. Neurology 42:795-800. Schrader M, Schulz-Knappe P (2001) Peptidomics technologies for human body fluids. Trends Biotechnol 19: 55-60. Adkins JN, Varnum SM, Auberry K J, Moore RJ, Angell NH, et.al. (2002) Toward a human blood serum proteome analysis by multidimensional separation coupled with mass spectrometry. Mol Cell Proteom 12: 947-955. Chen YY, Lin SY, Yeh YY, Hsiao HH, Wu CY, et al. (2005) A modified protein precipitation procedure for efficient removal of albumin from serum. Electrophoresis 26: 2117-1227. SeverynMyronovkij, NazarNegrych, TetyanaNehrych, Maria J Redowicz, SerhiySouchelnytsky, et al. (2016) Identification of a 48 kDa form of unconventional myosin 1c in blood serum of patients with autoimmune diseases. BiochemBiophys Rep 5: 175-179. Laemmli UK. (1970) Cleavage of structural proteins during the assembly of the head of bacteriophage T4. Nature 15: 680-685. Rombouts Y, Willemze A, van Beers JJ, Shi J, Kerkman PF, et al. (2016) Extensive glycosylation of ACPA-IgG variable domains modulates binding to citrullinated antigens in rheumatoid arthritis. Ann Rheum Dis 75:578-585. Rombouts Y, Ewing E, van de Stadt LA, Selman MH, Trouw LA, et al. (2015) Anti-citrullinated protein antibodies acquire a pro-inflammatory Fc glycosylation phenotype prior to the onset of rheumatoid arthritis. Ann Rheum Dis 74: 234-241. Gudmann NS, Hansen NU, Jensen AC, Karsdal MA, Siebuhr AS. (2015) Biological relevance of citrullinations: diagnostic, prognostic and therapeutic options. Autoimmunity 48: 73-79.